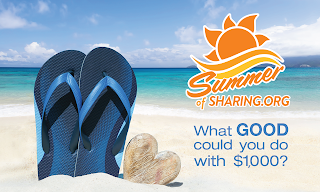 Community Financial Money Matter$ Blog: It’s Time to Give Back with the Summer of Sharing! It’s Time to Give Back with the Summer of Sharing! This summer, Community Financial will donate $1,000 a day to nonprofit, educational, and community organizations throughout Michigan from June 11, 2018 to August 31, 2018. In total, Community Financial will donate $60,000 to local organizations this summer! This program is just one of the ways we give back to the communities we serve, but we can’t do it without your help! We need your input to let us know which groups are making the greatest impact in our communities. Starting June 1st, you are invited to visit SummerOfSharing.org to submit an essay-style nomination explaining how your favorite nonprofit helps the community. These essays will stay live on the site for others to learn about how the nominated organizations are making a difference. Our Summer of Sharing program has assisted schools, arts organizations, senior centers, youth programs, animal organizations and much more! Two of last year’s recipients included the e-Nable Novi Public Library Chapter and the Otsego County Child Welfare Alliance. The e-NABLE community is an amazing group of individuals from all over the world who are using their 3D printers to create free 3D printed prosthetic hands and arms for those in need. The Novi Public Library, Novi Community School District and FRC 503, Frog Force have joined together to make an impact in people’s lives by helping those who can’t afford a prosthetic. Our Summer of Sharing donation helped provide funding for this exciting program. We were also able to help the Otsego County Child Welfare Alliance, which is a small nonprofit that serves children and their families in Otsego County. This group provides every new mom with a safety sleep packet and basic supplies. They also provide families in need with necessary items like safety gates, first aid kits, and whatever else they need to keep their babies safe. President/CEO Bill Lawton is excited to keep this tradition of sharing alive in 2018.